On the watch for humpbacks off the coast of Cape May. Cape May Whale Watcher passengers stay on the lookout for marine life. You never know what you might see on a whale-watching adventure off the shores of Cape May. On this cloudless summer day, travelers aboard the Cape May Whale Watcher are hoping to spot the elusive humpback whale. The Cape May Whale Watcher is one of several vessels that ply the Atlantic in hopes of spotting whales and other sea creatures. The company—run by Stewart Sr. and his son, Captain Jeff Stewart Jr.—first set sail off Cape May in 1993. Today, it boasts the resort town’s largest and fastest whale-watching ship. “My dad loves boats, and he loves seeing whales and dolphins on top of that, so he wanted a boat that would be faster, that would go further, that could carry more people,” Stewart Jr. says. “The speed is what makes the difference. If you do get a whale, you can stay out longer and come back quicker.” The company offers various cruises from mid-March through December; all guarantee marine mammal sightings, or your next trip is free. The morning dolphin cruise, sunset cruise and dinner cruise—all with various food and drink packages—usually give passengers an eyeful of bottlenose dolphins and other marine life. The afternoon whale- and dolphin-watch tour—three hours on weekdays and 2-1/2 hours on weekends—takes passengers the farthest from shore, where they are more likely to encounter whales (see box, page 35). My choice for the day is the afternoon whale- and dolphin-watch cruise, which embarks from the Miss Chris Marina on Spicer’s Creek. As I board, passengers scramble to the snack bar, visit the restrooms and find seats, both indoors and outdoors. Soon, we push off from the dock, and Stewart Jr. comes on the loudspeaker system to share trivia about our surroundings. Much of the information is provided by the Mid-Atlantic Center for the Arts & Humanities. We enter the Delaware Bay and pass the Cape May Lighthouse, a landmark since 1859. The lighthouse’s beacon, Stewart Jr. informs us, can be seen for 27 miles on a clear night. We cruise past another local landmark, the sunken wreckage of the SS Atlantus, one of 12 concrete ships built after World War I by the Liberty Ship Building Company in Georgia. The bulky ship met its doom off Cape May Point’s Sunset Beach after a storm tore her free from her moorings in 1926. Pausing from his prepared monologue, Stewart Jr. points out a bald eagle. The eagle is a common site hereabouts; a nesting pair lives close to the water’s edge. Passengers scramble to the port side for a glimpse. The captain asks everyone to keep their eyes peeled for sea life and warns those at the front of the ship that they might want to move back. As if on cue, seawater splashes up through the chrome grates at the bow. Children scream in amusement as they are showered by the cold, salty spray. Wind whips through our hair as the boat roars on. Stewart Jr. continues his narration, explaining the difference between dolphins and harbor porpoises. The porpoises, we learn, are two times larger and generally visit the Jersey Shore in the winter months. As we get farther out to sea, the search grows serious. The captain exchanges information via cell phone and radio with other whale-watching ships in the area and with spotting planes that fly along the coast. The pilots are on the lookout for schools of bunker fish, or Atlantic menhaden, a major food source for many species, including humpbacks. Where there are bunker fish, there are often whales and other marine mammals. The 110-foot Cape May Whale Watcher can reach a top speed of 21 knots and is equipped with modern radar and active sonar equipment. But with as many as 400 people on board, the ship’s passengers can be just as helpful spotting marine life as any sophisticated equipment. All eyes scan the horizon. Within a few miles of the shoreline, a crew member spots the first fin. Passengers rush to either side of the ship, squeezing against the rails—cameras and phones ready—as the boat slows for a look. It’s a bottlenose dolphin pod, Stewart tells us over the loudspeaker. The pod includes a calf, no more than a few weeks old. The dolphins come within a dozen or so feet of the ship, rising effortlessly out of the choppy water to breathe and, perhaps, catch a glimpse of us watching them. Dolphins are curious creatures who sometimes come right up to the boat. The crew does everything possible to avoid harming them. When watching dolphin pods, the three-engine boat drops down to a single engine, traveling no more than 2 knots; sometimes it just floats with the tide. Unlike dolphins and much of the other sea life observed when voyaging, several species of whales—including North Atlantic right whales—are listed as endangered on a state and federal level. Humpback whales—which can grow up to 60 feet, weigh 40 tons and eat 3,000 pounds of krill and small fish a day—were nearly hunted to extinction in the 1960s. Their numbers have begun increasing, but humans remain their biggest threat via entanglement in fishing gear, ship strikes and the overfishing of prey species. We’re also major drivers of climate change and pollution that destroy the whales’ natural habitat. 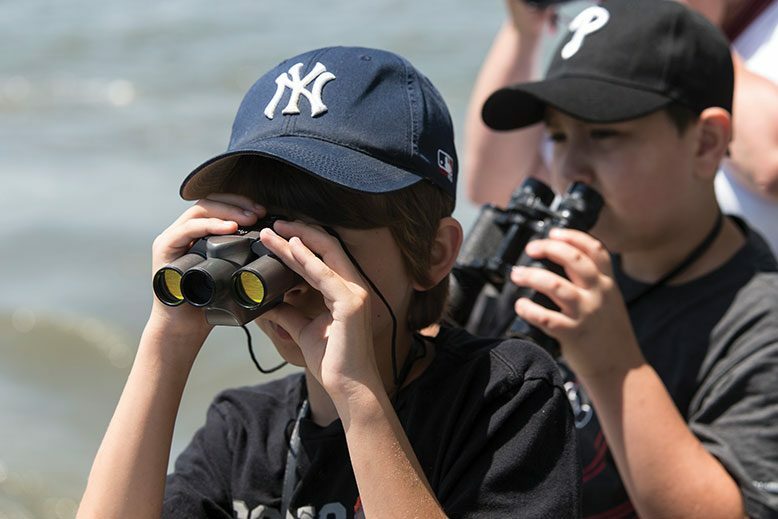 Because of this, the Cape May Whale Watcher takes part in a voluntary program called Whale SENSE, which provides strict rules for commercial whale-watch operators in keeping with the Marine Mammal Protection Act of 1976. Under the rules, vessels cannot come within 100 feet of a whale, cannot approach a whale head-on, and must always follow a whale from behind. Right whales are so endangered that vessels cannot come within 1,500 feet of them. Stewart Jr. says his crew functions as the eyes and ears for organizations like the Whale and Dolphin Conservation Society and the National Marine Fisheries Service. The crew reports vessels that are not following best whale-watching practices. Cape May Whale Watcher has also partnered with various organizations and local universities, assisting with tagging marine mammals, collecting skin samples and identifying members of dolphin pods to study their life cycles, personalities and habits. On this day, the captain estimates we have seen a combined total of 100 dolphins. The boat shifts into high gear once again, and we head farther out to sea, still hopeful there’s a humpback in our future. We cruise for several miles, the land slowly fading behind us. We are about 20 miles from shore. But there is not one sign of a whale—no gush of water from a spout or lusty splash of a powerful tail. Unfortunately, it’s time to turn back. The ride back to Cape May Harbor is bittersweet. The captain docks, the boat and crew members immediately begin washing down the decks. The vessel carries more than 50,000 people a year, so upkeep is essential. Passengers aboard the Cape May Whale Watcher. Captain Jeff Stewart Sr. provides commentary while son, Jeff Jr., stands by. Read more Animals, Jersey Shore, Outdoors articles.